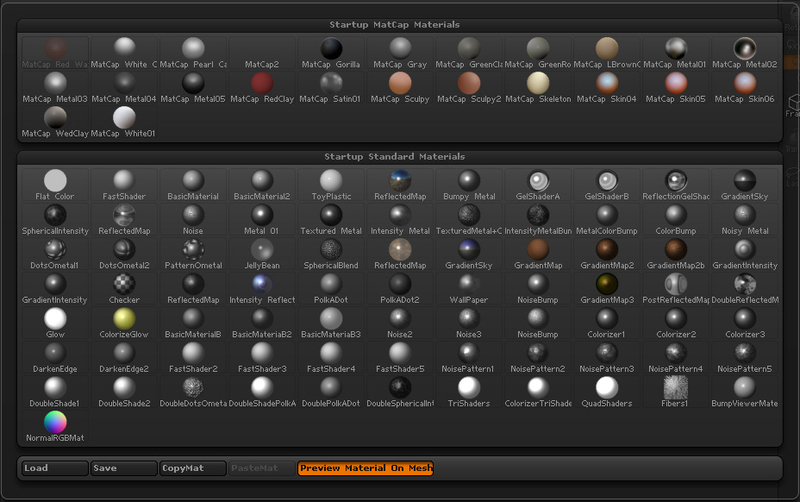 The Materials Quick Palette shows all available materials, including those custom materials that are loaded at startup. To launch the quick palette, click the large Current Material material thumbnail in the Material Palette or on the left shelf. Alternatively, with the cursor off the canvas, press F6 on the keyboard (Windows only). If the Preview Material on Mesh button is switched on, placing the cursor over a material thumbnail will show a preview of that material on a 3D Mesh, providing the mesh is in Edit mode. To choose a material, click its thumbnail. The Materials Quick Palette provides several other buttons for working with materials.